Wondering why you should be funny on social media? Wondering why you need to incorporate humor in your marketing? Humans love humor and to laugh. There’s not one person that dislikes laughing and being entertained by something funny. But apart from just the health benefits of laughing, humans do enjoy laughing. And the best part is that when you get someone to laugh, they tend to like you more, something that can be beneficial in marketing. Because the truth is, the majority of viral content that you see on social media is humorous. This means that content that is humorous have a greater viral appeal, and a bigger spreading effect. Today, we’re digging into a topic that isn’t spoken about a lot, but one that can drive you incredible marketing results on social media. In this article, we’re looking at Why You Need to be Funny on Social Media (and How To Be). Who can use humor in social media? Well, to answer your first question, yes, you can. Because as mentioned earlier, everyone loves to laugh. Essentially, there are no, or very few brands that shouldn’t use humor in their marketing. Since everyone loves to laugh, you’re not restricted just because you have a different target audience, however, it is important to know what jokes you are appropriate to use and how you should use them. Because the thing is, if you’re insensitive, or make inappropriate jokes, there’s a risk about it backfiring. This is why it is more important to know what humor you should be using, rather than if you can use humor at all. Before you can use humor in social media, it’s therefore crucial that you know your target audience. Obviously, if your target audience consists of 20-year olds, the humor you should use will look a lot different from a target audience of 60-year olds, right? If you’ve never done it before, using humor in social media marketing can be a bit scary, because you never know how your audience will react. But you should have in mind that some of the top brands are using humor, and they’re getting amazing results from it. 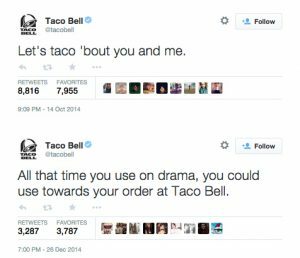 This tweet from Taco Bell from 2014, for instance, saw an amazing response from its audience. Now, let’s look at why humor in social media marketing is something you need to pay attention to. There are more users on social media than ever before. This also means that there is more content than ever that’s being put out. In fact, on Instagram, 95 million posts are shared daily on Instagram alone. What’s more, on Facebook, over 350 million photos uploaded daily. Needless to say, the competition in standing out from the crowd and getting your target audience’s attention is tougher than ever. This is why it might not be enough to just share similar posts that everyone else is posting. When we are on social media, we’re scrolling and scrolling, but when we see something funny, we are much more likely to stop for a second and take a look. I bet it has happened to you. Probably no major news for you. But the truth is that when we laugh or even smile, positive emotional and psychological triggers are triggered inside the brain. Endorphins in our brain, which are neurotransmitters, are released when we laugh or smile. In fact, it is the endorphins in our brain that makes us feel happy. They also limit our stress levels. Therefore, when we laugh, we improve our mood and become happier. Moreover, we release negative emotions, making us more relaxed. And when you want to get someone to do something, for instance, convert, the last thing you want is an angry or stressed prospect. You want them to be relaxed and happy – something that humous makes them. Far too many brands portray themselves as conservative and boring. But no-one thinks that is any fun. By incorporating humor in social media marketing, you’ll be able to humanize your brand and become much more approachable. It’s hard to interact and build a relationship with a fancy logo and brand, but when you show a human side of your brand which has a humor, emotions, and laughs, people will be more likely to approach you. The truth is that this doesn’t just go for social media. In fact, this goes for all types of marketing. And if you think about it, many of the most famous ads ever created are just that: funny and humorous. When you get people to laugh, you make an impact on your audience. And when that happens, they’re much more likely to remember your brand. Humour also has a lot to do with your brand personality to do – especially on social media. For instance, if you are known to have a boring and conservative personality and brand voice, it probably won’t resonate very well if you incorporate humor in your marketing because it will come out of the blue. If you’re going to use humor in social media, you need to make sure that it aligns with your brand. Because only then will it come off as authentic, and make people remember it. Chances are, the ads you can think of that you saw most recently are all ads that play on humor. And that’s because they’re memorable! When you get your audience to laugh, that relationship equals a human connection that makes them feel connected to you on a personal level. If a brand makes us laugh or smile, we’ll feel as connected to them as when we’re laughing with our friends. Because what it means is that we can get our audience to feel like they’ve known us for a much longer time, and therefore, trust us more, by using humor in our social media marketing. Furthermore, it releases any tension that might be between you and your audience, and ultimately lead to stronger relationships. 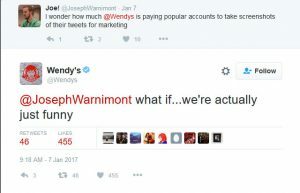 There are examples of brands that have realized the power of humor in their social media marketing, and what they’ve done is go out without any real plan or how they should use humor. And the result has become a total fiasco. Some have even felt the immense backlash that a social media audience can give you. So before you begin using humor in your social media marketing, there are a few things you want to consider. I’ve spoken briefly about this already. This is the most crucial part of a successful social media humor strategy. Because the truth is, all audiences have a different type of humor, and as a result, it is crucial to know yours. Moreover, you also want to know your audience in order to identify any jokes that may be conceived as inappropriate. Remember that you only have a few seconds to grab your audience’s attention with your post. This is why you need to make sure that you’re keeping it short and straight to the point. If people need to read line after line just to get to the punchline, you’re doing it all wrong. When using humor as a brand, you need to stay away from politics, racism, controversial topics, inappropriate words, etc. These topics are very likely to cause a social media storm against your brand, as a result of split opinions. This goes especially for racism or making fun of other people’s disabilities. Since the backlash can be so immense, it is much better to stay away from these topics completely. Yes, humor has proven that people will start seeing your brand almost like a friend once you’ve made them laugh, however, it shouldn’t just stop there. Try to understand your audience down to its very core, and then create humor around more relatable topics that are only related to the people in your industry, making them feel unique and selected. Moreover, you also don’t want to forget to engage with your audience once they start engaging with your post on social media. It is great to use humor for topical events. But you don’t want to select any events, though. You want to focus on events that are related to your industry and your target audience. Sire, events like super bowl is relevant to almost anyone, but the PGA golf tour might not be. This further emphasizes the fact that you should know your audience. You obviously want to be funny, make yourself approachable, and more humanized. But at the same time, you also want to show your brand’s intelligence and professionalism. Just because you use humor doesn’t mean you should lose the professionalism, right? This is why it is important that you find a great balance between humor and professionalism – so you never come across as an unserious business. The truth is that coming up with funny social media posts and jokes is hard. In order to succeed with your humor strategy on social media, you need to get help from people who know how you do it and get people to giggle. Moreover, to ensure that your humor resonates with your brand, and won’t step on anyone’s toes, you also want to have several people review your content before you post it. That way, you can minimize the risk of any social media storms. Therefore, as a brand, you should always look at ways you can impact your audience emotionally. Many brands are afraid of incorporating humor into their marketing and being funny on social media, but the truth is that the benefits far exceed the downsides (because frankly, if done in the right way, there aren’t many).